Description: ERA custom made roll bar, which has been extended three inches taller. For those who would like to run their ERA FIA Cobra on track, and must meet the track regulation that your roll bar be at least 2” above your helmet. Direct replacement for the original roll bar. Its an easy switch out on the ERA FIA car. 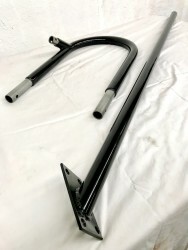 Roll bar is powder coated black. You can’t tell there’s any difference from the original roll bar. It fit in my car perfectly with no adjustment, as delivered from ERA. It’s been used one time, and looks brand new.